Home is a domain that is intimate to all of us. Beyond its everyday function as a physical shelter for people and their activities, it connects with its user on a personal and emotional level. The modern day scenario of environmental and financial concerns along with the desire to have more freedom has led people to follow simpler and efficient ways of living. With the rapid growth of technology and smart living there lies an opportunity for efficient spaces with the feeling of homeliness and personal touch points. The Tiny House Movement celebrates this concept of simple yet resourceful living. The homes can be designed as an innovation of maximum usable space in minimum footprint, thus redefining sustainability. Living small, yet Living it All. The Design of the house should be innovative and creative with a sustainable edge. The relation between the exterior and interior spaces ought to be taken into consideration. The proposal should be well conceptualized. Most importantly, the area of the house should not exceed 250 sq.ft. Mobility being a vital factor, the house need not be self-mobile, but should be treated as an extension that can be towed easily by a car or pickup truck. However, the participants can avoid the issue of mobility altogether but provide a strong justification for the same. Living Area | Sleeping Area for 2 | Cooking and Dining Area Toilet | Workspace. Client Interaction is one of the critical components of the design proposal. For the purpose of this competition, entrants may assume an individual, couple, or a genre of people, based on the design concept. 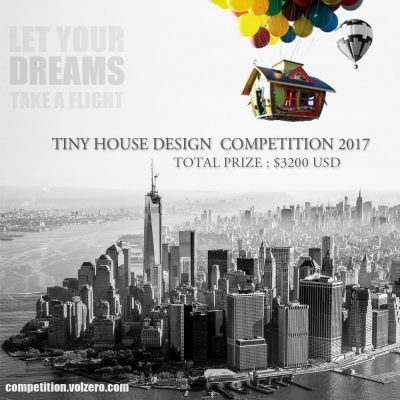 Tiny House Design Competition is open to all. We invite architects, students, engineers, designers, thinkers, companies, organizations and everyone interested in the mission of the competition to submit their ideas. No professional qualifications are necessary.